Are you looking for a better way to present and organize a selection of printed marketing materials in your place of business? 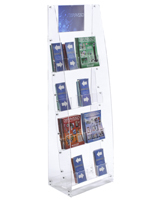 A clear acrylic literature stand is especially useful in high-traffic areas such as lobbies and offices due to its open design and easy accessibility. 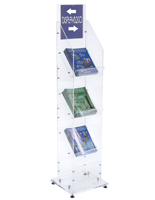 Many floor standing options available in this category include poster frames, which can entice customers to grab a take-away magazines and brochures for further reading. 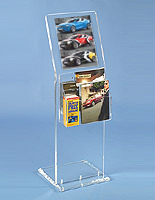 Use clear acrylic literature stands to provide clients with industry-specific media. Give customers the tools to make better informed decisions with these units. Educate your customer base with magazines, brochures, and periodicals to build brand authority. 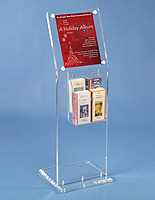 Clear acrylic literature stands come in many sizes, anywhere from a single magazine to sixteen pockets. 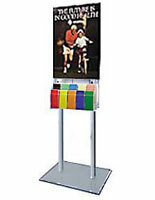 Some models include adjustable pockets, ideal for displaying multiple styles of printed media. 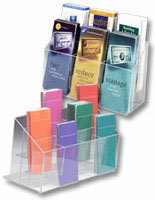 The transparent design of these clear acrylic literature stands blends in with the existing decor of any environment. What different styles of floor standing magazine racks are available? One of the most notable differences has to do with the configuration of the base. Models in this category include both single and dual post designs as well as units with square, rectangular, or circular bases. Each offers their own aesthetic value and purpose, and look great in any high-traffic environment. 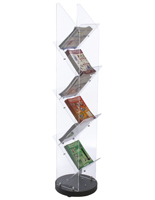 Depending on your needs, browse a selection of acrylic literature stands with fixed or adjustable pockets. Pockets that come with dividers can be changed to accommodate either 4" wide or 8-1/2" information. Many people choose these types when to be prepared to take on any printed marketing challenge. An effective advertisement tool, options with poster sign frames are ideal for sending a highly-visible message and prompting customers to take information home. Some of the frames are designed to fit 11" x 17" and smaller graphics while others can fit posters up to 22" x 28". 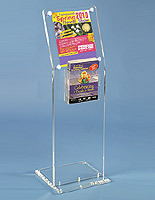 Where could these floor standing brochure racks be used most effectively? 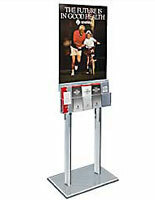 Rest areas and visitor centers alike are great places for these printed media displays. Each unit gives guest an opportunity to grab take-away magazines, brochures, and informational booklets detailing local events, trails, and attractions. Doctor’s offices especially love these units, as they can organize and present vital medical information to their patients in each waiting room. Being able to explain and educate patients about their medications and treatment options is an essential part of treatment, providing patients with take-home information for review. 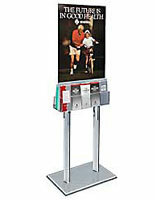 Retail locations use literature stands to display product catalogs or special offerings in highly-visible locations such as checkout lines or main entrances. 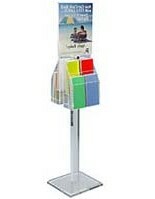 Position a floor standing unit where your customers frequent most to inform them of special deals, savings, and promotional events happening within your company. 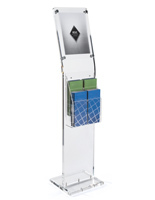 Colleges and universities often use these brochure display stands with sign frames to attract prospective students. Educational institutions are always adding new majors and changing programs, and these literature pocket stands serve as a great platform for distributing that information. Just as it is important to have a quality product or service, it is equally as important to inform your customers in an effective manner. Information is a powerful tool, so finding the best possible way to get magazines and brochures into the hands of your customer base is essential to any business’ success. With the literature racks in this category, and other wall mounted or countertop printed media displays available on our side, you are sure to find the ideal fixture for your needs. But don’t stop there! 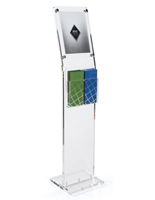 Our product line covers everything from metal and wooden literature stands to adjustable options that can adapt to the year-round needs of your marketing team.